Just made these this morning with some leftover quinoa from yesterday's breakfast. I was intending to eat them myself and save some for tomorrow. However, the kids (ages 8 and almost 6) asked to try them and they gobbled up all of my leftovers!!! I'd say these were a huge success!!! The original recipe came from fitsugar.com, expect it was not GF or dairy-free, so I made some changes and they were absolutely awesome. I am trying to avoid extra sugar too, so I did not put any syrup on my pancakes. The recipe made about 10, but I had 3 as my serving. After searching around my pantry and searching the internet for a possible coconut curry chicken, I came up with a recipe that my husband proclaimed the best meal ever! Sorry I don't have a picture to post yet, but I'm sure I'll be making this again in the real near future and I'll get one then. In large pan or wok, heat coconut oil on medium high and place each slice of chicken breast flat on pan, so you can slightly sear each side. (don't move the chicken around or you won't get a nice sear) Give each side 3-5 minutes, then flip. After the chicken is cooked through, juices running clear, remove from pan and set aside. Without cleaning out the pan, place carrot, onion and zucchini in hot pan. Stir them a bit and let them sit to get a little brown. They should still be tender crisp, just with a little color on them. While veggies are cooking, slice the chicken into strips, again matchstick size. Then, add chicken, garlic, curry, and garam masala. Stir to coat. Add tomato paste and stir to coat. Add can of coconut milk and mix thoroughly. The sauce will slightly thicken. Finally add salt to taste. Either serve over quinoa or in lettuce wraps (I used butter lettuce). *All of my ingredients are organic except for my spices, though I am trying to head in that direction. These may not look too pretty, but oh my! 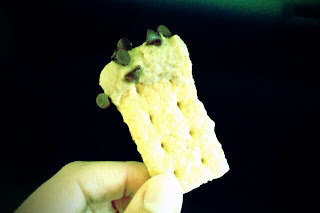 are these some of the yummiest little treats ever!!! And they are so simple to make! A friend of ours made them for our small group, then I made them for my Easter brunch! Delicious!!! The recipe was also found from Paula Deen via foodnetwork.com! Directions:Preheat oven to 400 degrees F.
Stuff each date with a pecan half. Cut each slice of bacon into 3 pieces. Wrap 1 piece around each stuffed date, place seam side down on parchment lined baking sheet. Bake until bacon is crisp, 12 to 15 minutes. Drain and serve. I don't remember where I originally got this recipe. However, it is fabulous!!! It is such a nice refreshing soup with flavors that will impress your friends, yet it is simple to prepare! It would even make a nice appetizer for your Easter meal! 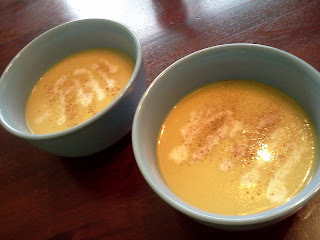 Drizzle one teaspoon coconut milk on top each bowl of soup, for garnish. WOW! After years of trying bazillions of different pancake recipes, some of which we've grown to love, I finally found a basic pancake recipe my kids and I devoured (hubby was already at work...next time babe :)). The great thing is that it is very versatile! You could add blueberries, mashed banana and cinnamon, nuts or swap out the regular milk for almond milk or regular flour for at least 1/2 whole wheat flour...etc etc! This recipe is a keeper for sure! I found it under Banana Pancakes on mybakingaddiction.com !!! There are a lot of other great recipes over there too! By the way, sorry there are no pictures, as they were eaten faster than I was able to get my camera out! 1. In a small bowl, combine flour, white sugar, baking powder, and salt. 2. In a separate larger bowl, mix together egg, milk, oil, and vanilla. 3. Stir flour mixture into liquid mixture and whisk until just incorporated, batter will be slightly lumpy. 4. If adding any optional ingredients, gently fold them into the batter. 5. Heat a lightly greased griddle or frying pan over medium heat. Pour 1/3 cup batter for each pancake. Flip when bubbles appear and underside is golden brown. Serve immediately. NOTE: My daughter said they were so good that they didn't even need syrup or butter! The first time to make them we made no substitutions and just used the basic recipe, no add ins! I hope you all enjoy this as much as we did. UPDATE 1/27/14: Since going gluten free, I swapped out the wheat flour in this recipe for Trader Joe's gluten free all-purpose flour. A couple weekends ago I found this recipe at Everyday Belle, as I was looking for a healthier pancake recipe. Well, it was a HUGE hit with my kids! So, I just got done making them for the second time this morning, only I played around with the recipe a bit more today. 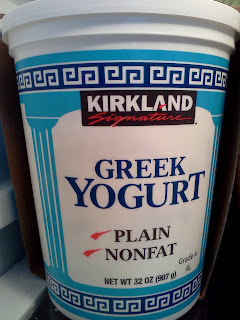 The first time I made it I used plain, non fat/sugar free greek yogurt and surprisingly my kids still gobbled them up! Today, I had some left over orange flavored greek yogurt that none of us really cared for, so I decided to use that up in the recipe and I added 1/4 teaspoon of Spice Islands pure vanilla extract (which doesn't contain corn syrup, as many others do). I have to say (and I don't get paid in any way by the company...in fact I don't get paid for any part of doing this blog) that Spice Islands products are awesome!!! They are a bit more expensive, but worth it! A sweet friend of mine recently said that good things aren't always cheap and cheap things aren't always good. I think that is SO true! 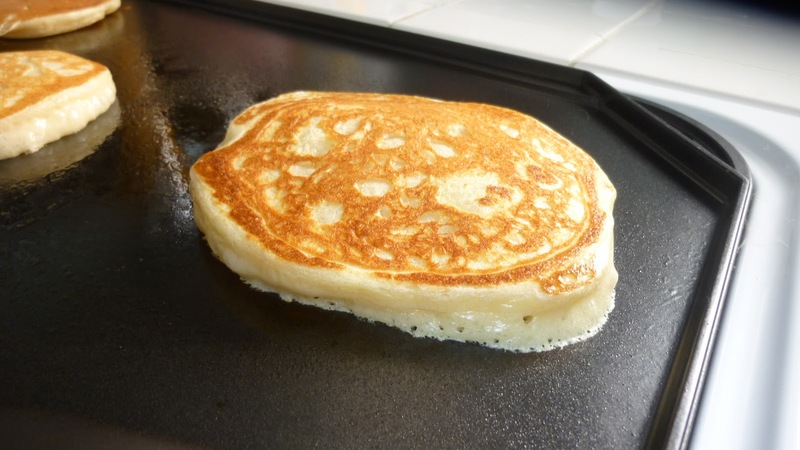 Anyhow, back to the pancakes...the batter is super thick, but they produce a very light pancake. Make sure you resist the urge to continue stirring the batter as you make the pancakes. It will fluff up a lot as it sits and that is what helps make them so great! You can use any flavor yogurt you want, but the fact that my kids were just as happy with the sugar free version, I think I'll stick to that next time! I hope you enjoy this recipe as much as I do. Thank you to Paige at Everyday Belle! Turn on the stovetop to medium heat using a griddle (or non stick pan). Spray pan thoroughly or butter if you desire. While pans are heating up, mix wet ingredients. Then, mix in flour and baking soda until well combined. 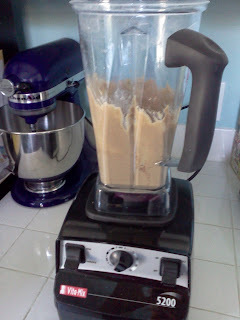 Let stand for a couple minutes, until mixture is fluffed up (resist the urge to mix again). The batter will be very thick. Plop onto pan and spread gently with the back of a spoon. Flip when edges are looking a little less wet. They will not get the same bubbles that you may be used to seeing on pancakes, so you'll just have to test these. Flip an extra time, if needed, to ensure the batter is cooked in the center. Mix together in a spray bottle. Squirt lightly onto the floors and wipe with a soft cloth. Make sure not to leave this or any other product on your floor for any length of time or you could damage your floors. My new favorite substitution and my 4 year olds new favorite snack are the same thing. His snack just has a little twist. 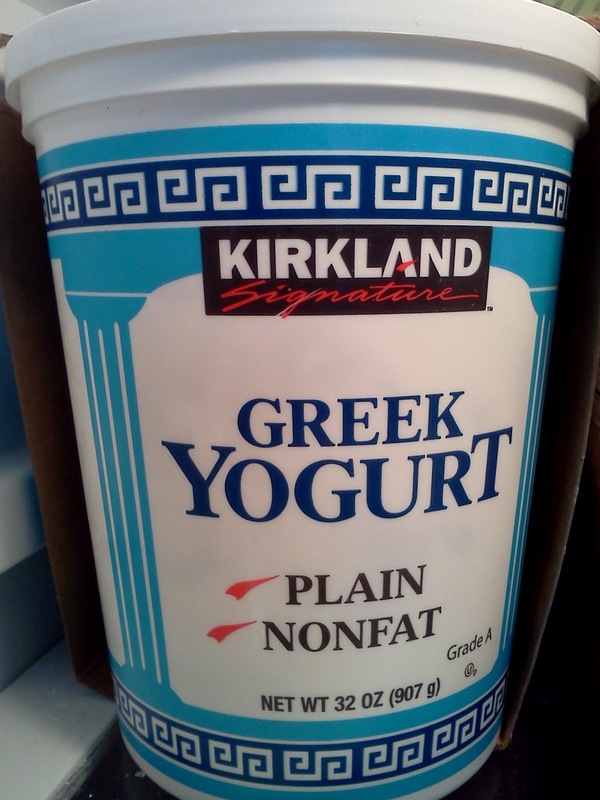 NON-FAT Greek Yogurt! I have enjoyed substituting it for any recipe that calls for sour cream! I hope you find this new healthier substitution useful as well! *I buy it at Costco and 2 large tubs cost about $7 total! A great deal! Mix the cocoa powder and the water in a saucepan. Heat and stir to dissolve the cocoa. Add the sugar, and stir to dissolve. Boil for 3 minutes over medium heat, stirring constantly. Be careful not to let it get too hot and boil over! Add the salt and the vanilla. Let cool. 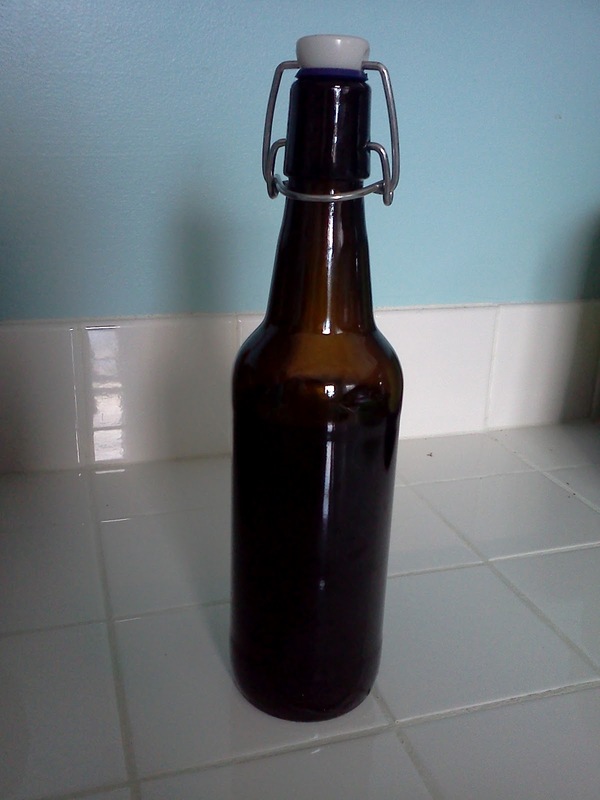 Pour into a clean glass jar, and store in the refrigerator. Keeps for several months. Yields two cups. NOTE: I bought my jar at a local store that sells specialty beers. Mine contained Schwarzbier. You just need a large enough container to hold 2 cups. Amazon.com also sells a variety of fliptop bottles. I originally found this recipe on Pinterest and we really enjoyed it. I printed it out, but can't find the reference to the website where it came from. Anyhow, it is easy and delicious and I hope your family enjoys it as well! Add all ingredients, EXCEPT cream cheese, to crockpot. Remove and puree 1/3 soup with cream cheese (or use immersion blender, to blend to desired smoothness). Let soup warm up for 15 more minutes. 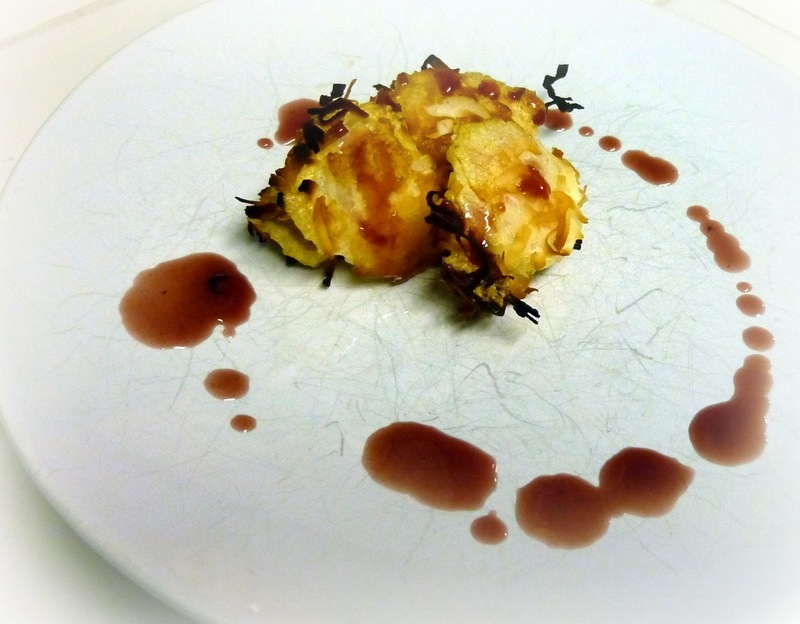 Top with garnishes if desired and enjoy! 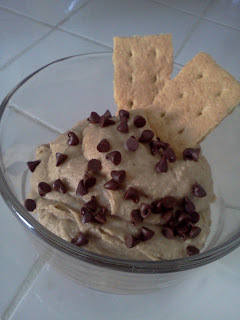 This awesome recipe you might already know, but my dear friend Alecia made it for me after I had one of my children. It was an instant hit! That was over 4 years ago and I have no idea why this recipe hadn't made it on here yet! So, since I wanted to cook it tonight for dinner, I thought it was about time to post it too! Crazy enough, I had to call said Alecia for the recipe! Now it will forever be on the internet so I can always remember how to make it. Really it is easy enough that I should know it by heart. Maybe now I will! Thank you Alecia for many awesome recipes and for being a totally awesome friend! Cook chicken breasts. I just boil mine until cooked through (no pink), then cube. In a 2 quart casserole dish, spray bottom with non stick spray. Then mix sour cream, chicken soup, broth and toss in chicken pieces. Pour mixture directly into the bottom of the dish. 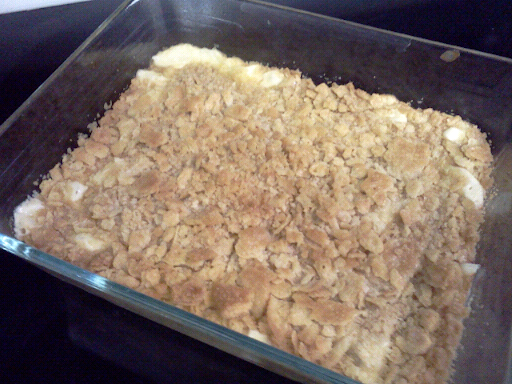 Finally put crushed crackers on top and drizzle melted butter over crackers. While cooking, prepare rice, as it usually takes about 30 minutes for rice to cook on the stovetop. Please bear with me and feel free to give me your suggestions. I am playing with the design of the blog. I want something simple that is easy to read. I saw another design with a bunch of different colored forks, knives and spoons and I kind of liked that. Not sure what to do? Thanks for hanging on for the ride! Preheat oven to 400 degrees and line a cookie sheet with parchment paper OR heavily coat a pan with non stick spray. In a small bowl beat eggs whites until soft peaks form. Place cornstarch and coconut on two separate plates. Hold shrimp by the tail (or stick 2 or 3 on a skewer, if de-tailed) and dip and coat with cornstarch. Next, dip the shrimp in the egg whites until coated and finally cover with coconut. Place shrimp on the cookie sheet and bake for 15-17 minutes or until coconut is golden brown. Make sure to turn them once, halfway through (around 8 minutes into cooking time) to make sure both sides are browned. While shrimp finish cooking, and if you choose to make a dipping sauce...you may scoop out the jelly into a microwave safe dish and heat until melted for 10-30 seconds (depending on the wattage of your microwave). Stir in horseradish if you want to add some spice to your sauce. Finally, serve hot out of the oven with raspberry dipping sauce. Would you believe if I told you THIS (below), could turn into something that resembled cookie dough? Would you believe that both my 6 and 4 year old ate it and said they LOVED it? Well, it's true! Thanks to Katie, at ChocolateCoveredKatie.com, I turned garbanzo bean, dates, raw cashews, oats, pure vanilla extract, salt, baking soda, almond milk and chocolate chips into a most wonderful treat!! In a bowl, cover the dates with 1/2 cup water. Let this sit for at least 8 hours. 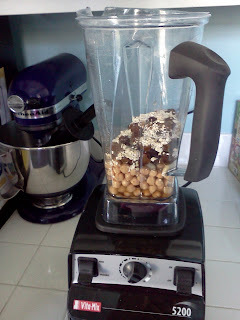 Then add all ingredients (including the dates’ soaking liquid), except chocolate chips, to a food processor or high powered blender and blend until very smooth. 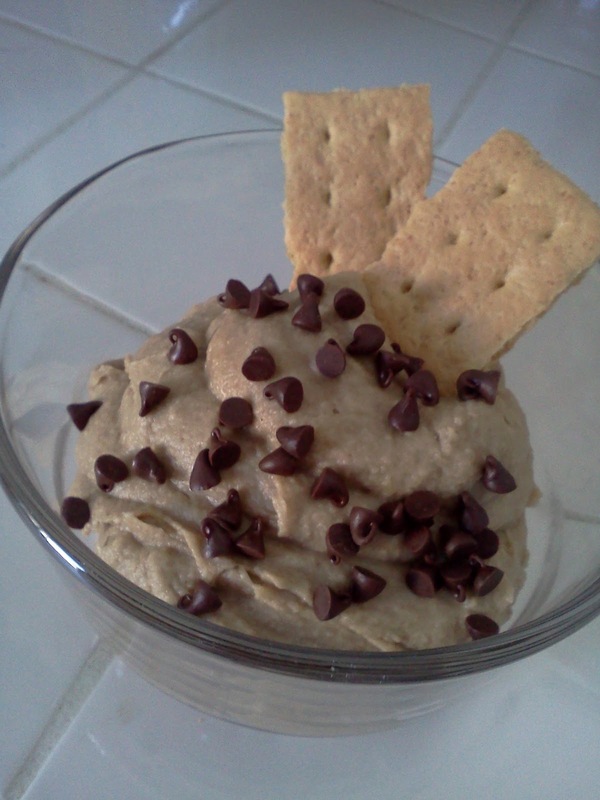 Chill and serve with Graham crackers, on top of ice cream or just eat with a spoon! THANK YOU @Chocolate Covered Katie!!! Here is a "raw" peach pie, which simply means non of the ingredients were ever cooked in any way! Everyone that tasted this pie enjoyed it! I was truly surprised, as this whole "raw" thing is still very new to me. I would definitely make this again! It was terrific!!! Finely chop the almonds in a food processor or Vita-Mix. Add the rest of the crust ingredients and mix thoroughly. Spread the dough out evenly on the bottom of a pie dish. Put 2 peaches in the food processor or Vita-Mix. When they are finely chopped, add the rest of the filling ingredients, EXCEPT for the last 2 peaches. Blend thoroughly, and remove from processor. Slice the remaining 2 peaches and mix with filling mixture. Stir gently by hand. Pour filling into pie dish. Garnish with mint sprig if desired. Wondering what my deal has been? Where have all the recipes gone? Well, I've been a little preoccupied! Imagine this...the writer of the Mummies Yummies blog gains over 35 pounds?! You might say, well no surprise there! She clearly likes to cook, therefore, she probably likes to eat! I mean there is even a picture of her shoving her face with food in the sidebar!!! All of that is true, but would you believe it if I told you that I never struggled with weight in my life. When I was in high school, I was always a healthy weight. Not toothpick skinny, but I could eat whatever I wanted to and never weighed more than 120 (and 5'6"). Then, as an adult I settled into weighing around 135-140. I was "fine" at that weight, but didn't feel super fit, but I also didn't gain weight even if I ate a bunch of junk. I must say, I didn't appreciate my weight and I didn't take care of myself, never thinking that one day it might not be so easy for me! Well, that day came! It happened slowly. After I had my second child, I easily dropped all of my pregnancy weight and returned to my 130's! Little by little the weight starting creeping on and my energy level took a dive. Then as I found myself weighing 150, I wondered what on earth was going on. Well, it turned out I had a bit of a transient hypothyroid problem. Basically, that meant that something in pregnancy had brought on the condition causing my thyroid to quit doing it's job and it caused my weight to increase more easily than usual. But within less than 1 year, my levels went back to normal. I should have worked harder to drop the weight then (3 years ago), if I had only seen what was coming in the future! Now, I'm not saying that if I did anything differently that it would have changed my condition or kept it from coming back, but I might not have had to start out so far behind the game with my weight. So, as I just eluded to, the condition came back...and with a vengeance! 6 weeks ago I was again diagnosed with hypothyroid and Monday of this week it was confirmed that the cause is a condition called Hashimotos! Apparently what happened was somewhere along the line, my immune system decided to attack my thyroid, thus killing some of it off and now it's not doing it's job again! So, with that, I re-launched a blog that I had private over 18 months ago and went public with my weight loss journey! This has meant a new way of eating for me. Now I have to be very purposeful when putting food in my mouth. I need to make sure it is truly fueling my body. I don't want to be a slave to my thyroid and the various conditions (like high cholesterol and heart disease) that can come with it, so I am going to feed my body well. I'm not ok with putting on more pounds and just blaming it on my thyroid. I know that if I am not intentional about what I eat, the "bad" stuff will turn right into extra unwanted pounds! And with unwanted pounds, could come unwanted side effects...so as a mother of two young children, I am going to put my best foot forward and get healthy for my kids sake! Then, please follow me! I'd love the support! Thanks to my dear friend Keli, I now have a wonderful recipe for homemade granola. I have tried many many recipes and haven't been too thrilled with any of them. A few of them were ok, but this one is absolutely awesome...so great that I'm not sure I will ever buy store bought granola again! I hope you enjoy it also! Line a baking sheet with parchment paper, silpat or grease. The directions call to melt butter or oil in saucepan and blend remaining ingredients into oil, then pour over dry ingredients, but I skipped this step and dumped everything into the large bowl by accident. Fortunately, it turned out great. Spread onto prepared baking sheet and bake for 20-30 minutes (min took about 40 minutes), stirring every 5 minutes until golden brown. Do not overbake! When it comes out of the oven it will still seem soft, but as long as it is nicely golden brown in color it should crisp up nicely upon cooling. Place baking sheet on wire rack to cool. Once the granola has completely cooled, stir in dried fruit if desired and store in airtight container or plastic bag. It will keep for several weeks. I have been trying to take this blog in a more healthy direction, however the look of the blog did not reflect that at all! 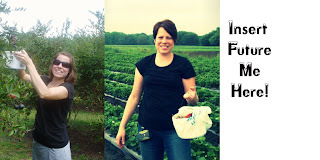 So, with the help of a super sweet gal...I have been working on a new look for the blog! I will still be posting tried and true recipes that real people have fed to their families and enjoyed! I just desire to offer you recipes that are made with fresh ingredients, that are healthy, and finally and most often more importantly for those busy families...SIMPLE! I found and slightly modified this recipe from the Six O'Clock Scramble recipe book. It is really easy and delicious...even for non-bean eaters. It is very cheesy, so picky people even enjoy it! Preheat oven to 350 degrees. Spray 8x8 pan or loaf pan with non stick cooking spray. In a large bowl, mix together all ingredients except tomato sauce. Spread mixture evenly in dish. Cover with aluminum foil and bake for 45 minutes. We enjoy a fresh side salad with this meal! If you choose to prepare this and then freeze, follow directions as listed, but do not cook until day you desire to eat it. On day of eating, put dish in oven BEFORE you turn the oven on, then turn oven to 350 and allow to cook for 1 hr or until heated throughout. I have searched high and low to find just the right waffle recipe. Some have tasted too eggy, some too dense, some too fluffy...Frankly, I was feeling much like Goldilocks! :) Until finally, I came upon this recipe from recipegirl.com! I adapted it a bit by subbing some whole wheat flour and adding some malted milk powder (which sounds weird, but really made a difference in the flavor to me!). My daughter loves to have waffles in the morning, but it isn't always feasible to whip up a batch before school. So, I make these and sometimes double the recipe and freeze the cooked waffles in a large ziploc. Then, on the days she wants a waffle, I just pop them in the toaster for a yummy and healthier breakfast! Best part for me (as always)...I know exactly what is in them! 2. In a large bowl, whisk together flour, baking powder, sugar and salt. Add milk, oil and eggs and whisk together until smooth. 3. Spray waffle iron with nonstick spray. Pour batter into iron until it spreads within about 1-inch of the edges. Cover and bake until done (on my waffle iron, the light goes off when done). 4. Lift cover, loosen waffle with a fork and serve immediately. This is an ever popular recipe that many of my family (mainly my sister), request on a regular basis. Sadly, my sister and I live all the way across the country from each other so it has been years since I have made it for her. However, she is a fabulous chef and baker, so I have no doubt she will be able to make this even better than me! :) I hope you enjoy it as well. 1.Preheat oven to 350°F. Grease the bottom and 12 inch up sides of an 8x4x2-inch loaf pan; set aside. In a medium bowl combine the flour, cinnamon, baking soda, salt, baking powder, and nutmeg. Make a well in center of flour mixture; set aside. 2.In another medium bowl combine egg, sugar, shredded zucchini, and oil. Add zucchini mixture all at once to flour mixture. Stir just until moistened (batter should be lumpy). Fold in nuts. Spoon batter into prepared pan. 3.Bake for 50 to 55 minutes or until a wooden toothpick inserted near center comes out clean. Cool in pan on a wire rack for 10 minutes. Remove from pan. Cool completely on a wire rack. Wrap and store overnight before slicing. Apple Bread: Prepare as above, except substitute 1-1/2 cups finely shredded, peeled apple for the shredded zucchini. Tonight, I found this recipe at http://naturallyella.com. I had several yellow squash from our CSA and I didn't want to go the unhealthy (but sometimes yummy) squash casserole route and I was tired of the grilled or pan seared way too, so I figured I would give this a try. My husband and I enjoyed it very much! This would definitely be one that I make again! 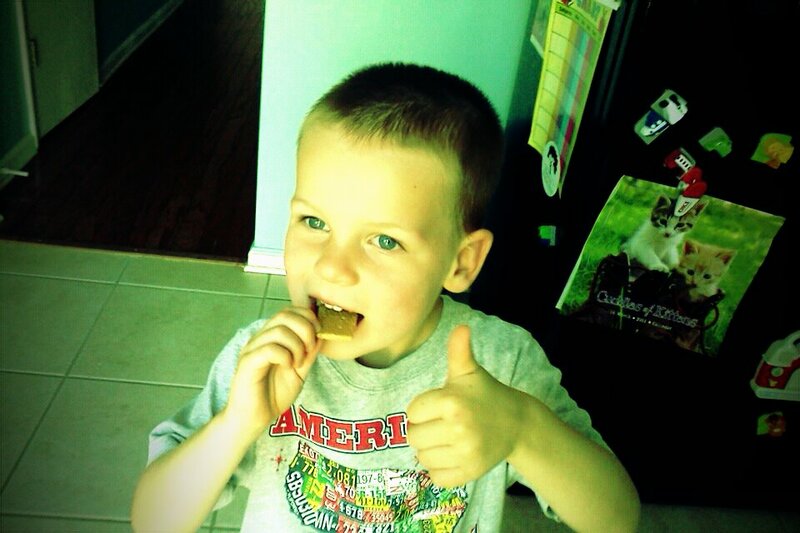 THANK YOU Erin for your post on naturallyella! Once potatoes are done, use an immersion blender or a regular blender to create a smooth texture in your soup. Return soup back to stove top, stir in coconut milk, and heat again until soup is hot. When ready to serve, place soup in a bowl, spoon 1 tablespoon each onto top of soup, and sprinkle a little paprika on top of each. *NOTE: picture above is mine! :) I wish I were a better food photographer! You have entered a recipe sharing site designed to offer families new "yummie" recipe ideas that have been tested and enjoyed. You don't have to be a "mummie" to join us! Happy looking and happy cooking! Have a recipe to share? ...Click the button below. Please share your reaction at the bottom of the post. You can leave a comment or simply click "A+", "Easy","Good" or "Not Again" You can choose more than one, Ex: "Good and Easy". There may be a recipe you would cook again because it was easy, but it wasn't the best thing you've tasted. So, let us know your opinion! Hi everyone! I thought I'd tell you a little about me. 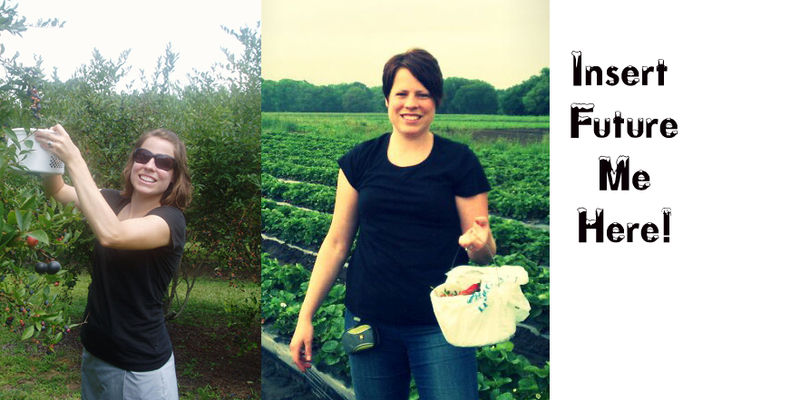 I am a SAHM, named Heather, who loves to cook!